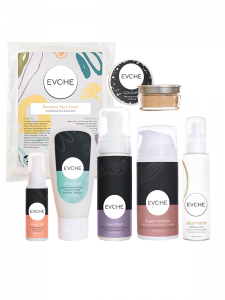 We understand that having acne and break out prone skin can be tough, which is why we have created this guide to start you on your clear skin journey! 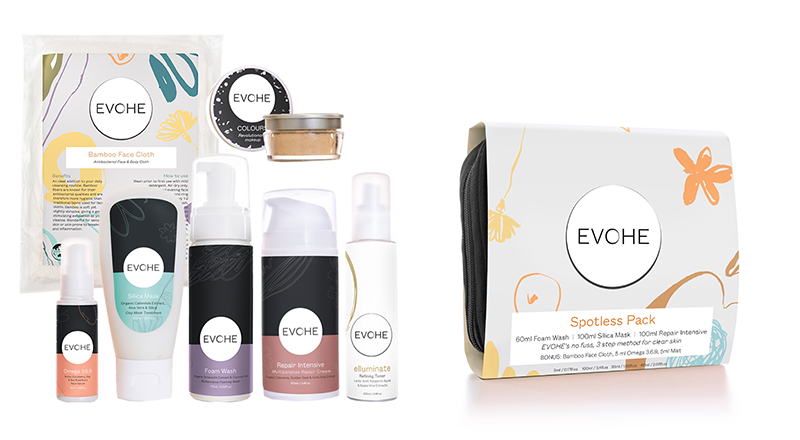 If you are after the ultimate kit to combat your skin, these are the products for you! 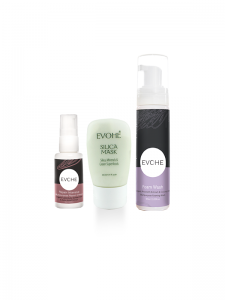 Foam Wash – cleans and balances skin out without stripping the skin of its natural oils. Be careful using cleansers that foam, as they can often contain harsh surfactants which dry out the skin, further irritating acne and overproducing oil. Our Foam Wash is able to foam due to the pump mechanism, there is nothing in the formula that makes it foam. So remember to ask yourself, is it the bottle or the formula that is foaming? Silica Mask – this mask contains white clay, which is the most gentle but effective on the skin. It breaks down the congestion and dry layers on your skin to renew and refresh skin. Use it as an overnight spot treatment as well to combat any spots! Repair Intensive – provides anti-bacterial moisturising relief to your face and body. It is highly effective on acne and assisting with skin renewal. 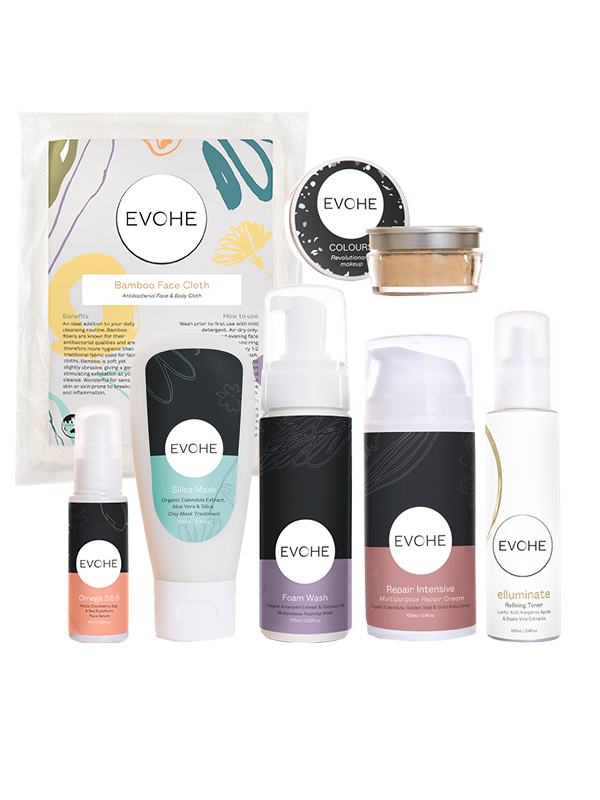 EVOHE Colours – mix with Repair Intensive for a natural foundation that won’t harm your skin or further irritate your acne. The coverage can be adjusted so that any redness or break outs can be covered. Plus you will have the healing effects of the Repair Intensive on all day. Bamboo Face Cloth – exfoliates the skin gently, ensuring a deep clean that removes congestion and makeup thoroughly. elluminate Toner – use after cleansing your skin to further break up any congestion and effectively remove dry, dull and dead skin layers. 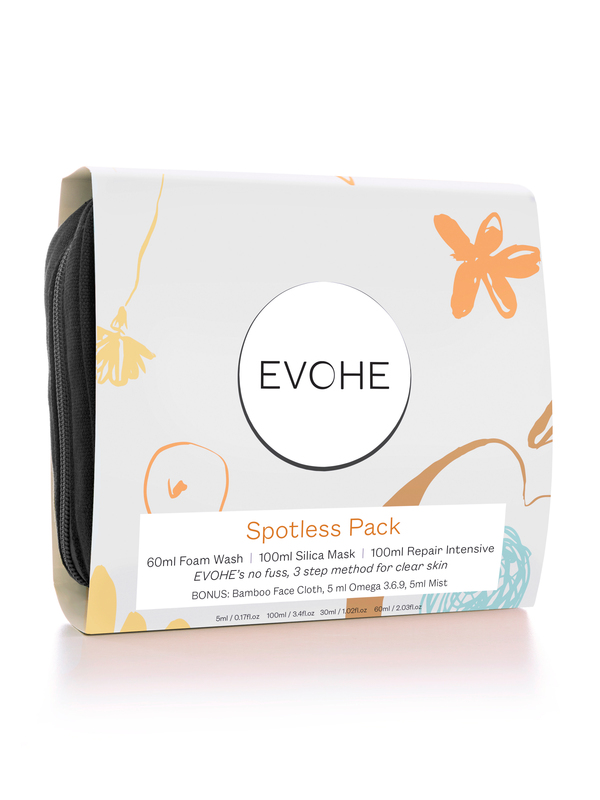 This allows your skin to absorb the full effects of moisturisers and reduce any excess oil being produced. Omega 3.6.9 – effectively balances out your skin by providing the nourishment that your skin needs. If you are just wanting the absolute essentials for helping your skin, then read on! Mist – daily refreshing spray that calms your skin. Not sure if you want to commit to the essentials yet? Then these are the products for you! 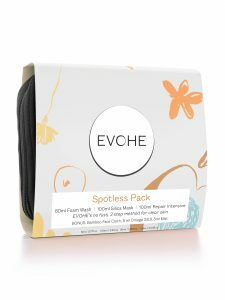 This entry was posted in Acne, Beauty, Products and tagged acne, beauty, evohe skincare, foam wash, omega 369, products, silica mask, teens.